Thunder Gods Gold. 1945. Barry Storm's famous work, the one the movie Lust for Gold (starring Glenn Ford) was based on. A wonderful book bursting with Storm's enthusiasm and speculations. A book from another era, great stuff, one work everyone interested in the tale must have. And the movie! just as melodramatic, romantic, and cockeyed as Storm. 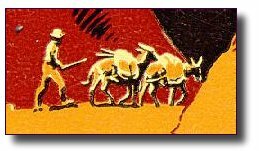 How much of the accepted interpretation of the Lost Dutchman story really springs from Storm's works in the late 1930's and 1940's? It has lots of on the spot work in the mountains reading treasure signs, trail markers, maps and such. Great photographs. It doesn't get any better than Barry Storm traipsing all over the mountains looking for lost Spanish treasures. Storm clearly was a promoter, so it is hard to judge if he really knew his stuff, but the telling of it is infectious and one starts to believe despite oneself. Swanson and Kollenborn cryptically remark in their In the Shadow of the Superstitions that a young mining engineer, Alfred Strong Lewis, "...was the author of Rain Gods Gold, and his manuscript was probably the source of Barry Storm's book Thunder God's Gold." CM: "Probably the best known book ever written on the Lost Dutchman Mine. Much worthwhile information and the author's suppositions and conclusions regarding the famed lost mine. This book was used as a basis for the motion picture, 'Lust for Gold,' starring Glenn Ford." Though the 1945 signed and numbered limited edition and trade edition are identical as far as content, paging, etc., there are several easy ways to tell them apart. The easiest way, obviously, is that the limited edition copies are signed and numbered. Another way is to note the subtle variations found on the dust jackets. 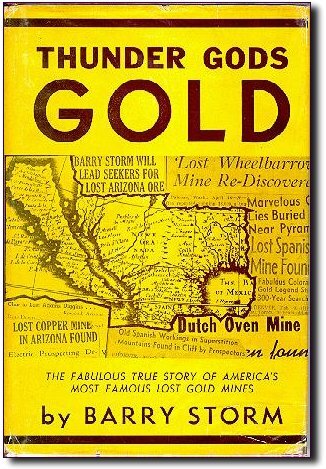 The dust jacket for the trade edition has the line "The Fabulous True Story Of America's Most Famous Lost Gold Mines" at the top and Storm's name right under the title. On the limited edition this line and the author's name are both at the bottom. Only the trade edition's dust jacket has a box at the bottom of the front cover quoting reviewers' comments on Thunder Gods Gold. Finally, on the back of the trade edition dust jacket is a box labeled "From the Publisher's Readers' Reports:" while the limited edition box reads "Said the Publisher's Editor." The dust jacket for the second printing, 1946, adds another variation. It looks very much like that used for the first printing trade edition, but stars are used instead of dots on the front to mark reviewers' quotes. On the back the box contains more reviewers' remarks, not "Publisher's Readers' Reports." There are other differences between the first (1945) and second (1946) printings: the half-title page is redesigned for the second, which is preceded by a page that lists Storm's books; the frontispiece caption is changed; numerous changes are made to the title page, see below; the dedication is moved from the copyright page to a new dedication page; publication information is added to the copyright page, see below; a Part IV is created by moving from Part I Signs of Treasure and combining it with Notes of Authenticity; the old Epilogue is gone, moved to the front and renamed Foreword with some change in content, see below; on the last numbered page a brief notice is added for Storm's new book Practical Prospecting and there is an additional unnumbered page added at the very end of the book with several illustrations from that work; and finally, a dozen or so photographs are moved to new locations in the second printing (in the process Storm overlooked the old location of the Signs of Treasure chart and left it in even though he repeats the same page later on page 154). The changes to the title page: under the author's name is added "Member: The Authors League of America" and "Illustrated by Author." "Treasure Trail Edition" moves to this page from the copyright page and also moving to this page is the logo found on the half- title page in the first printing. The date now reads 1946, the bars on the top and bottom of the Napoleon quote are gone and the wording of the subtitle changes from "The Amazing True Story Of America's Most Famed Lost Gold Mines, Epitome Of Western Traditions" to "The Amazing True Story Of America's Lost Gold Mines, Epitome Of Western Traditions." Storm adds new publishing history to the copyright page: "1st Printing: July, 1945 5,000 Copies 2nd Printing, Oct., 1946 5,500 Copies." The most significant change is his creation of a new Foreword and elimination of the old Epilogue. He does this by shifting the contents of the Epilogue of the first printing to the new Foreword found in the second printing. Storm edited the text of the Epilogue too, omitting about one and one half paragraphs, which read as follows: "In fact, I anticipate the disagreement of many with both the story and the data authenticating it which I have presented herein. And to all of them I put this question in advance rebuttal: Have they who claim the knowledge or experience which confounds my own actually put it to the test inside the Superstitions? If not, then how do they know whereof they speak? If not, then may I not be pardoned for asking their indulgence? For I have! (New paragraph) So I claim originality in the way that I have verified a thrilling epitomization of romantic frontier history by reconstruction of legendary events, in this way..."
This pattern of tinkering with the arrangement of the contents of Thunder Gods Gold became a Storm trademark, as you will see in my notes on other iterations of Thunder Gods Gold. Since 1945 Thunder Gods Gold has appeared in a number of different forms. 1. 1945 - the first printing. 2. 1946 - the second printing. 3. 1946 - the abridged version. 4. 1953 - the revised and enlarged edition, now spelled Thunder Gods' Gold! 5. 1953 - abridged edition, Thunder Gods' Gold! 6. 1953 - another abridged edition, Lost Arizona Gold. 7. 1953 - another abridged edition, Practical Prospecting. 8. 1958 - The Mountains that were God, Book II of Tales of the Southwest, possibly published separately. 9. 1967 - Thunder Gods' Gold: the Mountains That Were God. 10. 1986 - Robert Schoose's reprint, Thunder God's Gold. 11. ? - Bonanza of the Lost Dutchman, reprint of the 1945 Desert Magazine articles.